Paperback, with flaps, 224 pages, 19.5 x 24.0 cm, 7.7 x 9.4 in. With The Diet Compass science journalist Bas Kast stormed the bestseller lists. On the basis of countless studies focussing on food and eating, Bas Kast has demonstrated that a healthy diet supporting weight control has nothing to do with counting calories and that many clichés are out of date. The What and When of our eating habits are far more important. 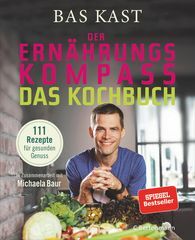 Now, in collaboration with recipe developer Michaela Baur, he has compiled a cookbook based on the conclusions drawn in his Diet Compass to take us through the day: 111 recipes and instructions for healthy eating at home and at work, with a traffic light food labelling system for every recipe. With their texts and accompanying illustrations the two cooking freaks prove that health and good eating are not mutually exclusive. "Never before has healthy food been so delicious!"